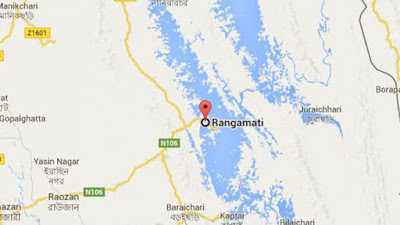 A Rangamati court today placed two arrestees with suspected links to Myanmar’s rebel group Arakan Army on a three-day remand. Law enforcers produced the arrestees – Cha Sui Wang Marma, 42, and Mong Cha Woang Marma, 39 – before Senior Judicial Magistrate Md Mohsin’s court in Rajasthali today with a 10-day remand prayer. Wahidullah Sarker, officer-in-charge of Rajasthali Police Station, confirmed the development to our Bandarban correspondent. The arrestees were caretakers of the two-storey Rajasthali house from where Aung Nu Young, 25, a suspected Arakan Army member, was captured on August 27. The next day, a joint team of the army and police detained Cha Sui Wang and Mong Cha Woang in Rajasthali upazila of Rangamati. The drive was launched around 10:00pm on August 26, hours after the Myanmar’s rebel group attacked a BGB camp in Bandarban that left one soldier injured. Two cases were filed with the police station, accusing house owner Ranaiju Rakhine and arrestee Aung Nu Young of trespass and carrying out terrorist activities.